Photographer Josh Newton captured these dramatic wedding photos earlier this month in Oregon—after a small fire in the vicinity grew out of control and the fire brigade arrived to evacuate all the guests halfway through the ceremony. He told us how everything happened. No one was in any real danger - the fire was 6 miles away. Right before the bride walked down the aisle in the middle of the ceremony, the firefighters came and told us we had to be evacuated now. The dad had to come down to all the guests and announce that we had to leave now and couldn't do the ceremony, but the coordinator talked to fireman into letting them get married if we shortened it all. But man it was so nerve-racking! Everyone was on the edge of their seats. I actually did shoot the photos that we had planned originally, first, before we left and got the wildfire photos along the road. I wanted them to be happy with their photos even though all the craziness was going on... I honestly took them thinking, I hope the couple doesn't dislike them or me for taking them, as its a pretty big reminder they had to move their whole reception! As I was taking the photos that you've seen, thats when I realized that what we were doing was pretty sweet. I still didn't know if they were going to like them, but I showed my couple the back of the camera and they were stoked. So that made me happy and excited to post them! The bride and groom were totally game - they had the best attitudes throughout the entire thing, which is probably the main reason why I was able to get such incredible photos with them being so in love. I doubt I'll ever be able to top the dramatic aspect of the photos, as it was a chance of a lifetime. However, I do hope I can continue to get incredible photos for all my clients in the future! I've gotten a number of wedding inquires from it, so hopefully they aren't expecting a wildfire.. I did get an inquiry for a wedding in Kenya however - maybe they'll be up for getting some awesome photos in a national park though! Josh readily admits that perhaps these are most dramatic wedding pictures he may ever take. 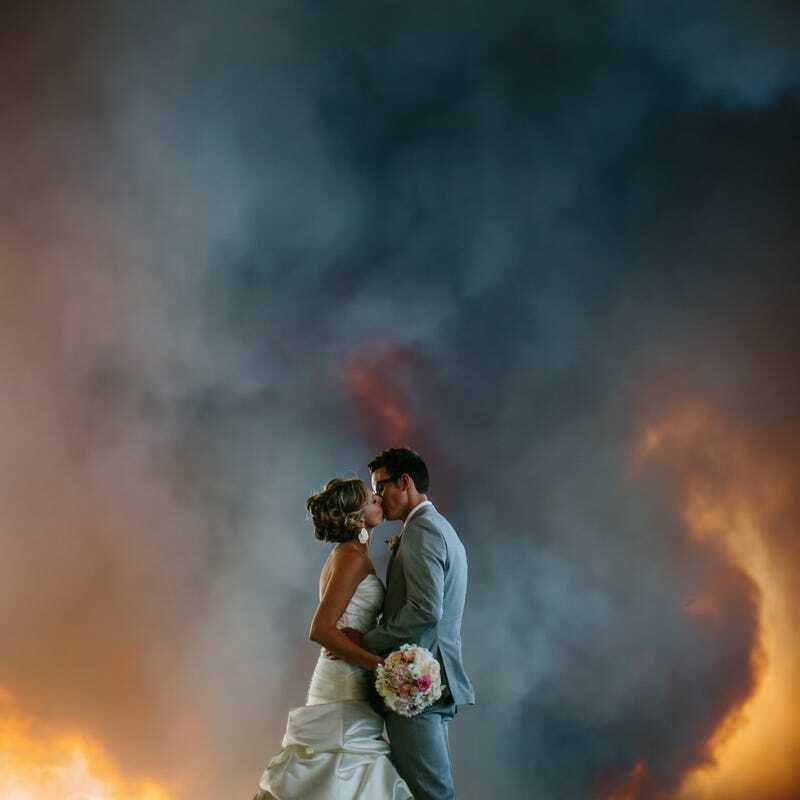 I would say that they are pretty much the most dramatic wedding pictures ever—other than taking wedding photos in the middle of a volcano eruption or as a zombie apocalypse rages on, there are not many situations that would end in this kind of fiery infernal backdrop. Josh Newton is a professional wedding photographer based in California. You can visit his website, follow him on Twitter or on Facebook.